Girls to the front! 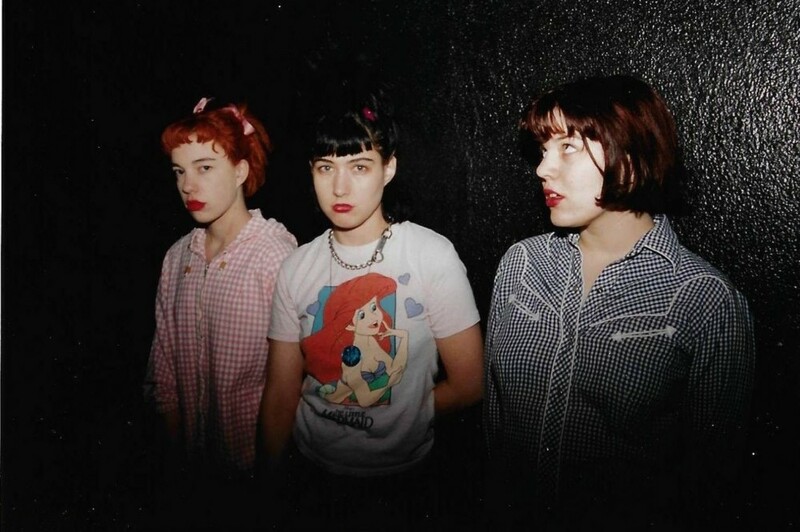 Earlier this week, Bikini Kill’s original members – Kathleen Hanna, Tobi Vail, and Kathi Wilcox – announced three reunion shows: 4/25 at the Hollywood Palladium; 5/31 at Brooklyn Steel; and 6/1 at Terminal 5. The band has been officially broken up since 1997 (they played “For Tammy Rae” at a book release party for Jenn Pelly’s 33 1/3 Raincoats tribute in 2017) though Wilcox and Hanna still play together as 2/4ths of The Julie Ruin. Bikini Kill have been steadily releasing vinyl reissues of their back catalog via their own eponymous imprint, as well as archiving materials – zines, flyers, demos, artwork, merch, personal photos – from the dawn of riot grrl, a movement they basically invented. But the “tour” announcement was definitely a pleasant surprise. The punk band drew criticism, however, because tickets were only available through AES’s ticketing platform AXS, which of course left some fans out in the cold, even as scalpers began posting tickets via secondary markets in excess of $900 (face value was just under $50 with service fees). The band immediately announced a second L.A. show for April 26th; it sold out just as quickly. It’s certainly possible that more shows could be announced (particularly in New York, Hanna’s homebase) but it’s always a bummer to have to hit refresh dozens of times to no avail. At least there are plenty of YouTube clips from Bikini Kill’s heyday. When Toto penned their only number one hit, “Africa,” released in 1981, they probably didn’t think about the tune’s longevity. Sure, it’s catchy, but no one could’ve predicted its late-exploding popularity as the lyrics made their way into countless memes and TV shows like Stranger Things and South Park boosted recognition. Now, thanks to Namibian-German artist Max Siedentopf, “Africa” is never going to go away – because he’s erected an installation in the Namib desert, in which six solar-powered speakers play an MP3 of the song on a constant loop. Siedentopf told NPR that the installation was “supposed to be a bit like a treasure that only the most loyal of Toto fans can find.” Indeed, it could be anywhere along the West Coast of Namibia, as the desert stretches some 1200 miles along the coast. Being a desert, the area is “nearly rainless,” and its name is derived from the Nama language, implying “an area where there is nothing.” And while it isn’t one of the two specific African landmarks mentioned in the song (Kilimanjaro/the Serengeti), maybe the installation will finally put Namibia on the map for Toto devotees. Panda Bear teamed up with Dean Blunt to create the video for “Token,” from PB’s upcoming LP Buoys (out February 8 via Domino). James Blake dropped a new album with very little fanfare; stream Assume Form below. Weyes Blood hasn’t officially given any details on her forthcoming record, but she’s shared its first single, “Andromeda,” which was produced by Foxygen’s Jonathan Rado. HEALTH is slated to release VOL. 4: SLAVES OF FEAR via Loma Vista Recordings on February 8 and have shared its blistering second single. Dawn Richard (aka D∆WN) shared “sauce” from her forthcoming LP new breed, which is currently streaming over at NPR ahead of its January 25th release. Experimental found-sounds duo Matmos celebrate the upcoming release of Plastic Anniversary (and 25 years as a band) with first single “Silicone Gel Implant;” they debuted some of their latest compositions at a Yo La Tengo Hannukah show this past December. SPELLLING shared “Under the Sun,” from forthcoming Sacred Bones LP Mazy Fly (out February 22). Following a few sold-out reunion shows, San Jose art rockers Duster are back in the studio and have released their first single since 2000 album Contemporary Movement. Xiu Xiu shared a disturbing video sequel to the equally disturbing “Scisssssssors;” both singles appear on Girl With Basket of Fruit, out February 8th. Cardi B teams up with City Girls in a video for “Twerk,” which seeks to reclaim the booty-shaking dance move for black women everywhere. Lastly, we can’t get enough of this Leggy track from their upcoming LP and are super pumped about their January 23rd show at Baby’s All Right with Daddy Issues and Desert Sharks. Lana Del Rey, Jared Leto, and Courtney Love starred in a Gucci commercial released this week, soundtracked by Link Wray. Cardi B posted an expletive-laden political rant via Instagram on Wednesday, criticizing the government shutdown. It’s already been remixed by the Autotune the News dudes. Belcalis Almanzar 4 Prez in 2o20! Panorama Music Festival is going on hiatus as parent company AEG looks to secure a new location. Sony has finally dropped R. Kelly in light of the disturbing allegations of his behavior toward women. Scrutiny has intensified for the artist since Lifetime aired their much-discussed Surviving R. Kelly documentary earlier this month. Matt Daniels has updated his chart mapping the largest vocabulary in hip-hop, with Aesop Rock topping the list. You can toggle it so that it shows only members of Wu-Tang Clan, who clocks in at #5 (the GZA’s solo work is ranked one spot above, at #4). Speaking of the Wu, there’s a documentary coming to Showtime in the spring that features the iconic NYC rap crew. Bandcamp is opening a brick-and-mortar outpost in Oakland in February. Gladys Knight has agreed to perform the National Anthem at Super Bowl LIII on February 3rd. The soul singer made some controversial statements about Colin Kaepernick, the quarterback whose police brutality kneeling protests left him a free agent. The halftime show will be headlined by Maroon 5, with special guests Big Boi and Travis Scott.